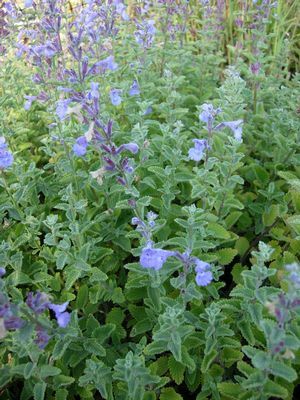 Walker’s Low catmint has soft gray-green foliage and forms a compact mound. It was voted Perennial Plant of the Year in 2007 by the Perennial Plant Association. Periwinkle-blue flowers bloom in early summer and provide nectar for butterflies and bees. Cut back hard in winter or early spring to maintain a compact habit. Walker’s Low has soft gray-green foliage and has a loosely mounding growth habit. It was voted Perennial Plant of the Year in 2007 by the Perennial Plant Association. Periwinkle-blue flowers bloom in early summer and provide nectar for butterflies and bees. Regular deadheading will help prolong the blooming season. Alternatively, you can wait until the first flush of flowers has finished then shear the plant back lightly all over with a pair of hedging shears or large scissors; this will encourage a second flush of flowers later in the summer. Catmint looks best planted in at least half a day of sun. It prefers well-drained soils, but is clay tolerant as long as it's not in waterlogged soils for prolonged periods of time. 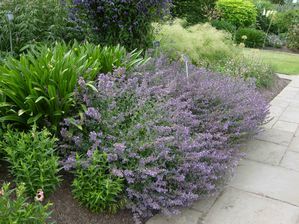 Once established, catmint will survive in cooler coastal areas with no supplemental water in the summer, although it'll look better and bloom for longer with occasional deep watering. In hotter inland areas, watering every 2-4 weeks should be enough, although plants will tolerate more frequent watering if necessary. Walker's Low catmint is cold tolerant down to at least 15°F. Cut plants back hard by about a third in late fall or early spring to maintain a compact habit. Native to the Caucasus, Turkey and Iran.